The Werner Ikelos Carbon Kayak Straight Shaft Paddle is an aggressive High Angle design for well conditioned and experienced paddlers who want a durable paddle with a powerful catch and smooth linking strokes. The Werner Ikelos Carbon Kayak Paddle Straight Shaft's full-size blades offer power for well conditioned paddlers, and the Performance Core blades are buoyant, light weight, and durable. The Werner Ikelos provides extremely stable bracing and rolling. It is the ultimate high-angle blade design paddle. Awesome paddle! I bought the Ike for rougher surf and offshore conditions. This powerful paddle has a huge surface area for digging deep, allowing a paddler to quickly get up to speed and brace firmly in the surf. Yet the Ike still comes in at only ~24 oz! This is the best bumpy water paddle made by Werner, and in my opinion the entire paddlesports industry. I ordered this in a 230 bent shaft to use with my fishing kayak. Great paddle. Great product. Stiff and light. Makes a long day paddling very easy. If you need a paddle for long distance and weight is a factor, this paddle works excellent for me. Very light weight and I am very pleased with the overall quality. Highly recommended! 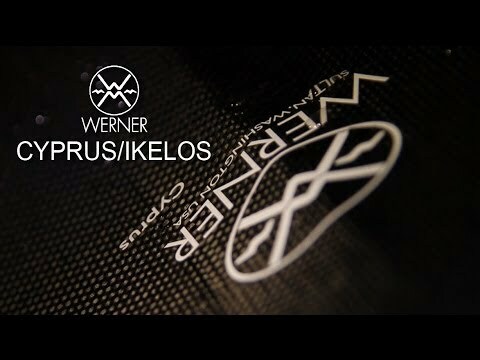 A: We could place a special order for a Werner Ikelos Carbon Kayak Paddle in the Straight - Small Shaft option. However, some special order paddles can take 2-4 weeks to fulfill, so if you're okay with that wait, give us a call and we can set that up. Q: Can I get an Ikelos Carbon straight shaft 240cm long? A: We can special order this for you in 240cm. Just give Customer Service a call at 888-828-3828 and they can get the order started.